So… Two weeks or so to go before NaNoWriMo officially takes off and I’m doing research. Snicker… Not really, just a much needed holiday and I leave tomorrow. But I am mentally chewing my options when it comes to NaNoWriMO. Should I pick up an existing project and just get stuck in it, should I explore something different, like a factual piece, or maybe just make something up on November 1st? These are questions you should be asking yourself, and start getting ready for the groundwork. Below are a few tips for preparing for the coming month. A bloodied baseball bat with a nail through it is found at a school. What happened? A disembodied spirit decides to explore the universe. What does it find? A niche bookstore hires new staff to deal with the holiday season. What happens? A pyromaniac is dealing with having his hands burned off. How does he cope? A romantic date in a castle goes poorly and the girl runs off. What does she find? People work in different ways, some can make with little to no outlining at all; others need all ideas prepped and organised with a full mapping of everything they want to cover. There is no ‘right’ way, so you’ll have to figure out which type you are. Personally I like the Snowflake method because of its more exploratory approach to writing and allows you to openly err without locking you to a specific idea. And you can stop outlining and start writing whenever you feel like it. We’re off and you’ve been writing for days (I assume), so how do you keep it up? How do you avoid turning a fun experience into a slog, something that just has to be done. Much like going to the gym or running, writing needs consistency to keep it going, yet if you push too hard, you risk burning out. Writing 50.000 words in 30 days averages out to 1.670(ish) words a day, so I personally aim at 2.000 words per sitting. It allows for a few off days (though I still intend to write every day), and mentally puts me in a place, where I know there is a buffer in case I want to maintain my social life. Using a physical reminder to track your progress, like a poster with your word count or achievement stickers in your calendar. I like shiny unicorns for that. Using a writing app for tracking and reminding. Some apps even have rpg elements to keep you going by giving you a character to level. Just be honest. Using a writing ritual to get the setting right. Some just need a cup of coffee and they’re good to go. Others have a uniform, or a writing hat, or a special chair that gets them going. Find your strong, but be careful that it doesn’t become a crutch. Using a friend. I know it’s a strange idea, but telling other interested parties of your work can help motivate you. Forums can also function as an outlet, just take care to get more writing than commenting done. This is supposed to be a fun learning experience. Something that gives you insight into writing, builds your skill and lets you express yourself. Keep it up, but don’t let it consume you. But what do you think? 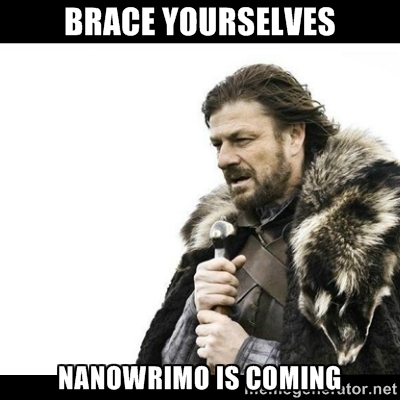 Is NaNoWriMo still an interesting project for you? Let me know.